Sorry about last month, but I will try to make it up to you this month by including some of the rarest Monkees--and Colgems--records. In 1970, the Monkees project was pretty much completed. Peter Tork was the first to leave, followed by Michael Nesmith, and Micky Dolenz and Davy Jones soldiered on as a duo for as long as they could. All because the Monkees TV show was becoming a staple of Saturday morning TV on CBS. Incredibly, while the first generation of Monkees fans generally were now listening to heavier sounds, kids born in the mid to late 1960s were making the Monkees TV show a hit all over again, albeit on Saturday mornings. This gave Colgems hope that a new album, "Changes," could revive the act, now down to a duo. While it didn't do the trick (see previous post), Colgems was not yet done with a major marketing ploy to keep the Monkees in the spotlight, at least with little kids. These records--found on the backs of cereal boxes--had been around since the late 1950s. I believe I remember seeing Mousketeers and Alvin and the Chipmunks cereal box records around this time, and this marketing tool was also used in intervening years, and not just on cereal boxes. For one, the Dave Clark Five promoted its film "Having a Wild Weekend" by having a cardboard record available on packages of Fresh Start Medicated Cleansing Gel. 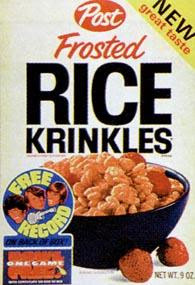 Anyway, Post started to sponsor the Monkees TV show on Saturday mornings, and three of its cereals were involved in the cereal box record campaign: Rice Krinkles, Alpha Bits and Honey Comb. These three sets of records each contained four individual songs, meaning that there were a total of 12 Monkees cereal box records available. All kids had to do was have their moms buy them the cereal, carefully cut out the record on the back, and place them on their turntable. What they got were low-fidelity tunes that these kids' older brothers and sisters probably had already, but the marketing ploy was a hit. In fact, the next to last Colgems LP was actually a mail order item accumulating all of the cereal box records tunes on a single LP (more about that LP in the near future). 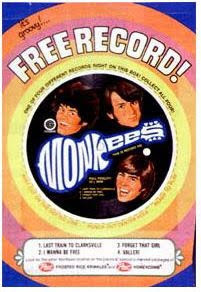 Although short-lived, the Monkees cereal box records established them as the first human rock group (remember the Chipmunks had them too) to be featured in a series on these records, and this was so successful that later bubblegum acts like the Jackson 5, Bobby Sherman and the Partridge Family had their own cereal box records--and so did another cartoon creation, the Archies. Cereal box records continued to be used as a marketing ploy into the late 1970s or very early 1980s. At around this time, soundsheets emerged, and, later, when CDs replaced vinyl as the listening format of choice, cereal box records became artifacts of a different, simpler time. 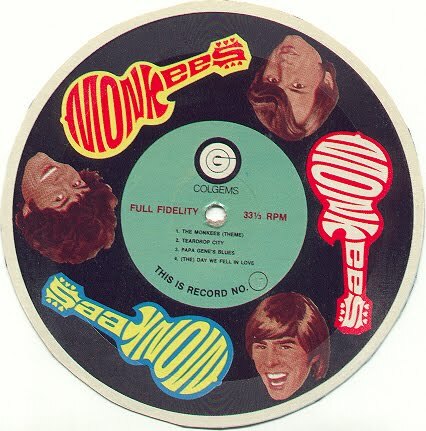 As for the Monkees cereal box records, there were three designs. Design No. 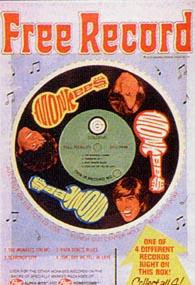 1, which was found on the Rice Krinkles records, featured Micky, Davy, and Mike and a green label with guitar logos between each head in spiral. The four songs on these records were 1. The Monkees (Theme) 2. Teardrop City 3. Papa Gene's Blues 4. The Day We Fall In Love. Design No. 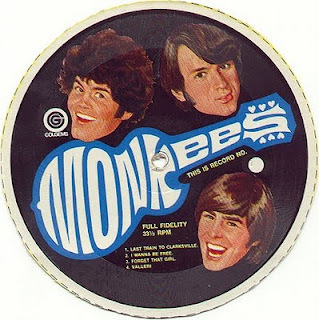 2, which was found on Alpha Bits, featured a large Monkees logo in the middle, with Davy, Mike and Micky's heads around logo on a black label. The songs included in this series were 1. Last Train To Clarksville 2. I Wanna Be Free 3. Forget That Girl 4. Valleri. Design No. 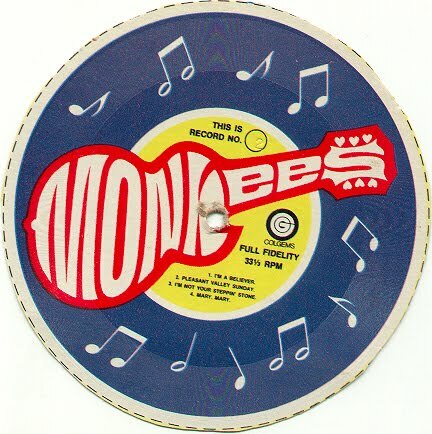 3, found on Honey Comb cereal, is my favorite, a red and white Monkees logo and musical notes on a purple background. The tunes in this series included 1. I'm A Believer 2. Pleasant Valley Sunday 3. (I'm Not Your) Steppin' Stone 4. Mary, Mary. You knew what song you were getting because in lieu of an actual catalog number, the number of the song was pressed into the cardboard. Each of the records played at 33 1/3 RPM. Here, for your listening pleasure, are a few of these cereal box records. Remember, the fidelity is horrible at best, and unfortunately, some of these have not survived very well, and they do skip. But as artifacts of a different time, they are among the most fun records that I own.